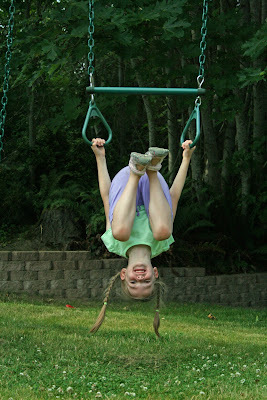 I have a very happy little girl in my house and it's all because I spent one naptime working on a project for her. 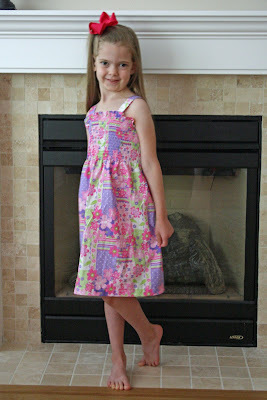 She now has a mama-made-sundress and loves it! It makes me smile to see how happy she is with it--she doesn't see the imperfections, she just feels the love I put into making this for her. I'm not a fantastic sewer, but this truly was an easy project even though I made it without a pattern. 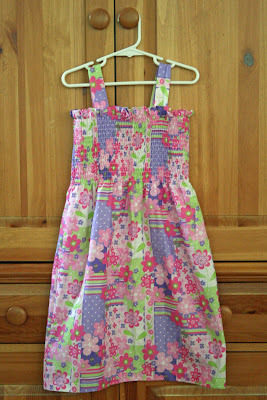 I bought presmocked fabric from JoAnn's to make this sundress. I measured my little girl's chest circumference and then also figured out how long I wanted the dress to be. I cut the panel of fabric to the right width and trimmed a bit off the bottom. Then I hemmed it and sewed the dress into a tube. 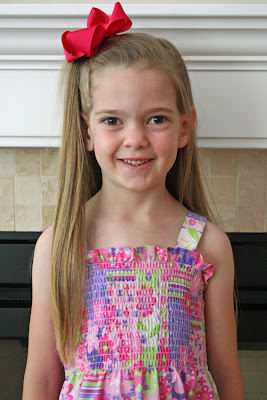 My next step was to make the straps--I just sewed two tubes (inside out) and then turned them right side out and sewed them onto the dress (after first trying the "tube" part of the dress on my daughter to figure out the placement of the straps. That's it! Easy Peasy, Lemon Squeezy! 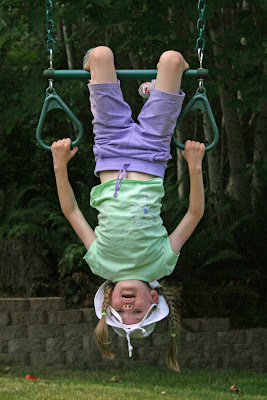 (And yes, that is her own pose!) For more projects, visit DIY Day at A Soft Place to Land. 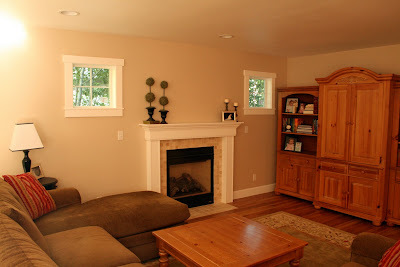 I'm glad we decided to add the three square windows--they really add some great detail to this big wall. 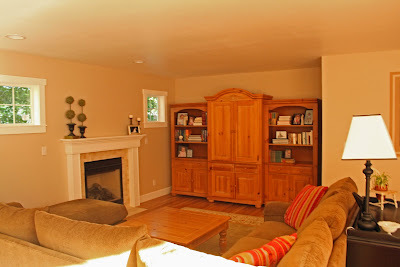 Isn't that entertainment center/bookcase thing-a-ma-jig a fabulous fit?! I love it! Ignore the frog tape that is on the wall around the doorway on the right--we're not done painting that particular doorway! 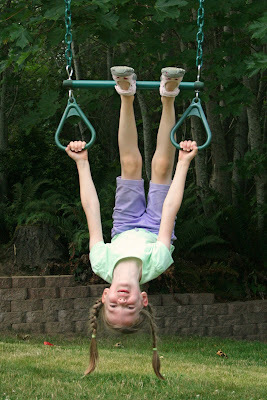 The doorway goes to the playcloset, not to a real room. We've had the armoire for eight years and love it. It is from the Broyhill Fontana collection--I think everyone who was married 7-12 years ago either owns something from this collection or has a friend who does! 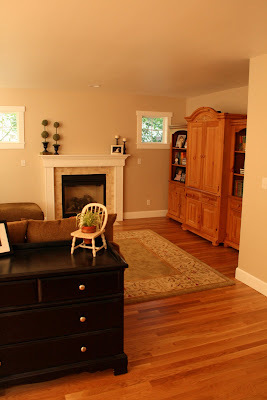 Anyhow, we never had room for the bookcases until now...and now they're discontinued! I've been stalking Craigslist for quite awhile looking for these...with NO luck. However, I was out garage saleing and spotted these in the back of someone's garage! Woohoo!! They had a lot of the Fontana collection--I even purchased their square coffee table, so now I no longer have a train table as a coffee table! I also bought a table and chair set from them, but that is a story for a different day. I forget the exact amount I paid for these bookshelves, but I think it was $275 total for both of them. I love them and the amount of STUFF I can store in them. The one on the right has my children's games and the one on the right has their puzzles. Clearly I'm not done decorating our new fireplace, but I'm loving its clean lines! 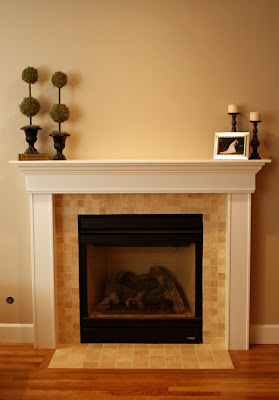 The tile is travertine and the fireplace itself is gas. And, for those who remember my post about carpet choices, I ended up buying two 8x10 area rugs (similar but not identical) from Pottery Barn. One is behind the couch in the soon-to-be-office-area and one is in the family room. As you can see in the picture above, I couldn't go bigger without either bumping into the wall or covering up part of the hearth in front of the fireplace. We decided the rugs would be our 8th wedding anniversary gift to each other--after all they fulfill the "pottery" requirement of the traditional gift list...or at least they do if you remember where I bought them from! Look at this gorgeous peony blooming! 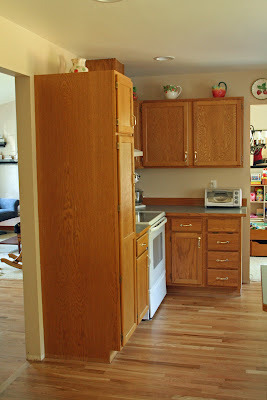 Last week I posted about starting our big kitchen cabinet makeover project--we're painting our oak cabinets white and adding beadboard and trim. I'd love to show you my finished kitchen...but I'm not finished yet. I'm not even finished with the first half of it! Ugh! 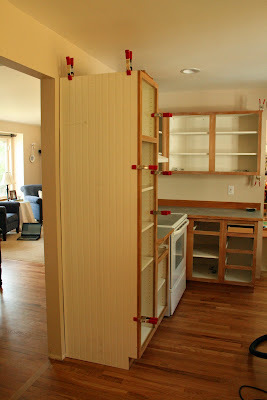 I did, however, finish a different project related to my kitchen. 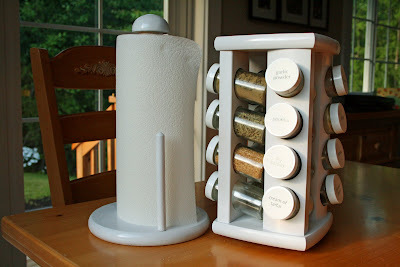 One of the comments on last week's post was that I should paint my spice rack white. This was a lightbulb moment for me! You see, I also have a wood paper towel holder that I've been thinking I need to replace because the wood is all dried out. But why should I replace it when I can spray paint it?! I admit to a brief moment of hesitation over spray painting my Crate and Barrel spice rack...after all, it was a wedding present eight years ago. Then I remembered that I'm kind of tired of it anyhow. However there was zero hesitation about spraying that Target paper towel holder! Woo! Way better! I'd love to show these to you in my kitchen...but the kitchen is in disarray and the counters are covered with cabinet doors. 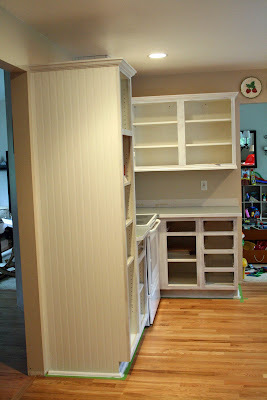 Stay tuned...the kitchen cabinet project is ongoing! 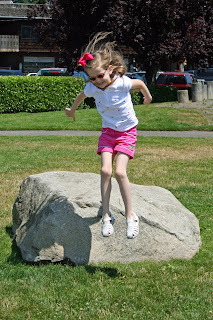 And the happiness on her face is what childhood is all about. 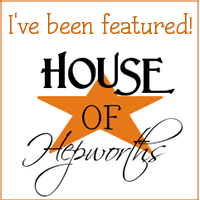 I really enjoy reading Tuesdays Unwrapped at Chatting at the Sky and I hope you will too. Cabinet Pulls ~ Decisions, Decisions! 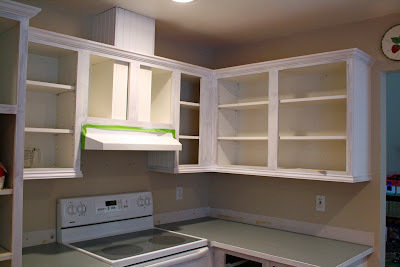 By now I'm guessing you've probably seen yesterday's post about painting my oak kitchen cabinets white. 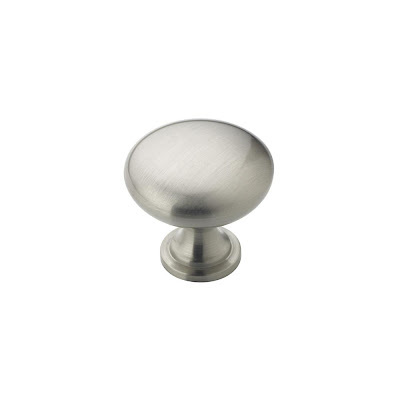 Instead of putting another coat of primer on them, right now I'm obsessing over handles and drawer pulls. 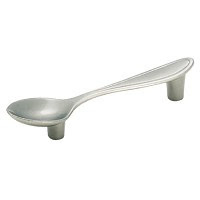 Well, really I would do forks and spoons, not just spoons. I'm not sure I'm funky enough for forks and spoons though...but my children sure would get a kick out of them! What do you think? 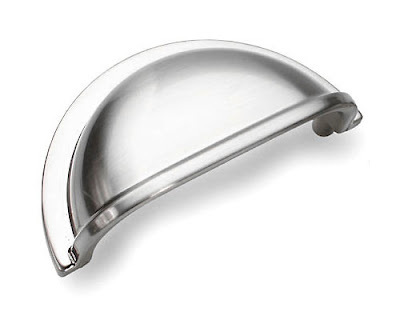 And polished chrome or brushed/satin nickel? This is my kitchen...lots of oak and gold handles and oak...and more oak. Did I mention that I don't like oak? 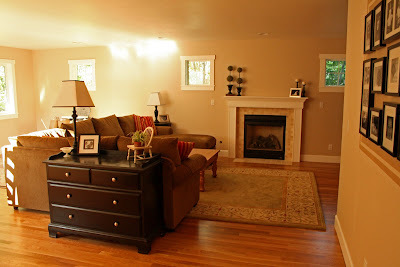 Now that we've expanded our family room (yes, I know I haven't posted "final" pictures of that!) and have a such a light and bright space with crisp white woodwork...well, the oak kitchen really doesn't flow with the space. I've been planning our kitchen re-do for quite awhile, but I wanted to wait until the addition was done. So, now is the time! We spent the three day holiday weekend starting this project. We didn't get as far as I wanted, but we made good progress. I was hoping to get one side (the stove side) of the kitchen done. That didn't happen, but I do like what did happen! 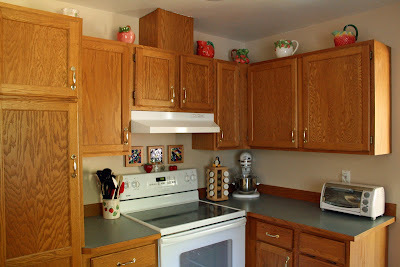 My plan for our kitchen is to put beadboard on all the exposed ends of the cabinets as well as in the flat panels on the cabinet insets. 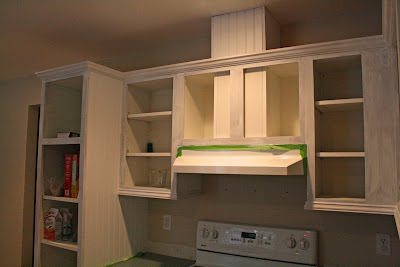 Crown moulding will go on the tops of the cabinets and trim will be added to the bottom edge of the top cabinets. Quarter round trim will go along the base of the cabinets to transition to the hardwood floor. 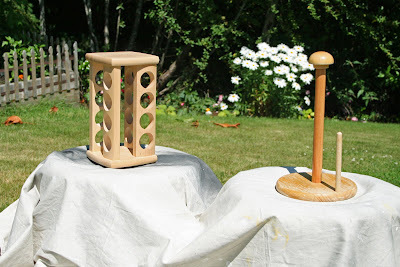 Everything will be sanded and painted a crisp white. 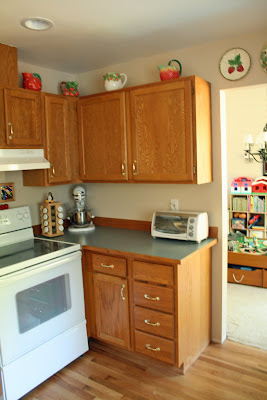 First we removed the cabinet doors and everything in the cabinets on one side of the kitchen. Then I started sanding the cabinets while my husband started cutting beadboard. We clamped up the first big piece of beadboard to see what we thought...and we loved it! Now my husband was beginning to see my vision for the kitchen! I kept sanding and my husband kept cutting. I sanded all the doors using a random orbital sander as well as sandpaper along the edges. I primed and painted the old hinges with spray paint as we're hoping to reuse them. 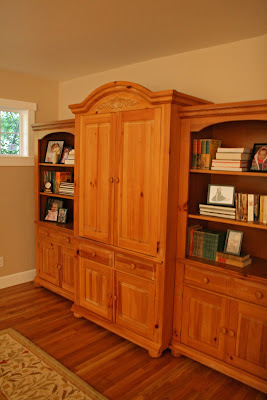 We attached the beadboard to the cabinet sides and door fronts using Liquid Nails and then my husband used finish nails and a hammer to attach the crown moulding and other trim pieces. Right now the budget doesn't allow for the purchase of a nail gun and compressor, but that sure would have come in handy. 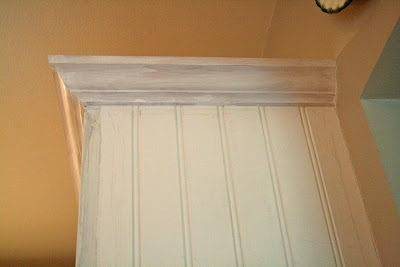 This is my husband's first time cutting crown moulding--I think he did a fantastic job! Oh and take a look at the countertop. 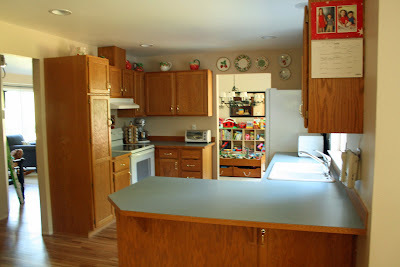 We have laminate counters with oak trim (yes, more oak!) that we're trying to save. I taped off the edge and primed it...and it is looking like it will work. At this point the cabinets have one coat of primer. I'll be priming them again before painting them with some high quality white latex paint that I bought from Benjamin Moore. I'm painting everything with a brush. We have a paint sprayer, but it isn't a very good one because we don't have an air compressor (that whole budget thing again) and I decided that sanding out drips from our cheapo paint sprayer would be a huge pain because of the beadboard. So far the brush is working really well! The beadboard panels fit perfectly on the flat surfaces of our kitchen cabinets. The faces of the cabinet boxes stick out just a bit on the front--so on the corners of the cabinets the edges aren't even. Does that make sense? Here's a picture where you can see how the beadboard just nestles right in there. Still a lot (a LOT!) of work to go, but I'm already thrilled with how much better our kitchen is looking. I really and truly love what we're doing to the kitchen! Stay tuned and I'll post more pictures as we continue with the process. Click the box above to go to A Soft Place to Land and see more projects! 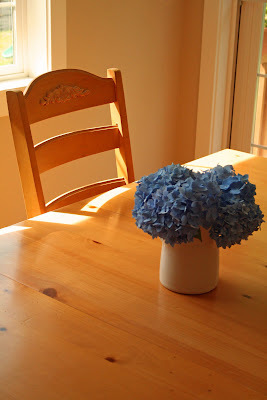 Or head over to The Shabby Chic Cottage for more Transformation Thursday projects! 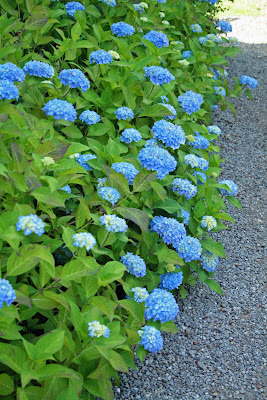 My Endless Summer Hydrangeas finally are in bloom! Oh how I love them! 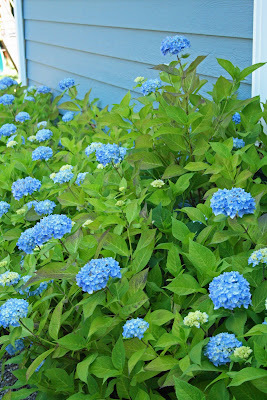 I have them planted all along the side of my house and they seem to be thriving there. They are taller than my 3 year old! 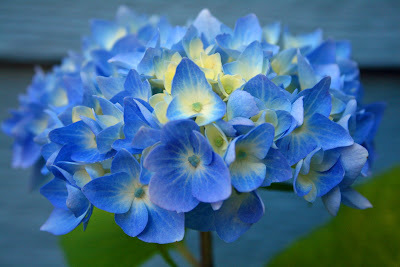 I just love seeing them in bloom. They're blooming earlier this year than usual because we have had a few spells of extra warm weather...although not today, that's for sure! Moments like this make me realize not only am I doing *something* right, but I also am extra blessed to have this wonderful little girl in my life. 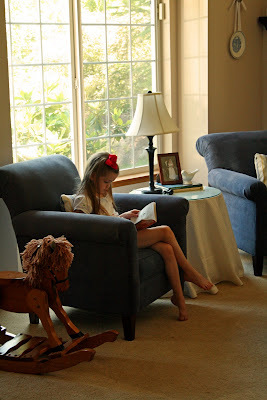 Seeing her immersed in a book when she has her choice of activities...well, it warms my heart. I love you more than you will ever know, sweet girl. 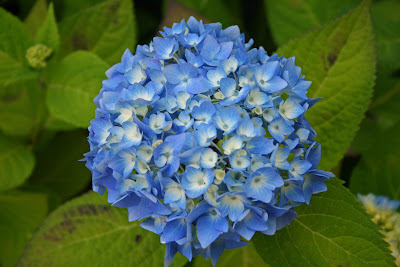 For more "small gifts of the everyday," visit Chatting at the Sky. 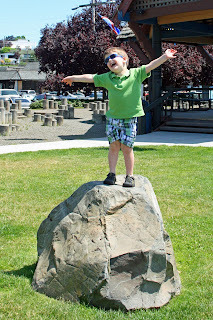 We had a busy weekend...mostly busy with the start of a HUGE project that I'll blog about later this week. H.U.G.E. !! 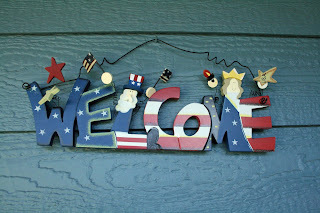 We did, however, find some time to celebrate the Stars and Stripes! 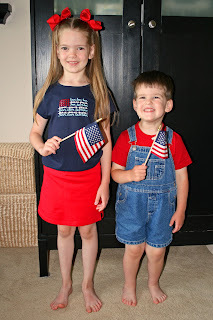 Princess and Handsome made these adorable flag placemats and had so much fun doing it! I did the cutting and they did the gluing. 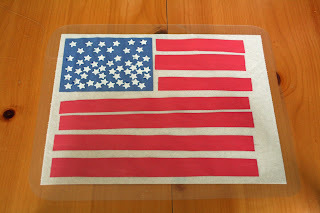 After they dried, I sandwiched their flags in clear contact paper and, voila! Cute placemats! 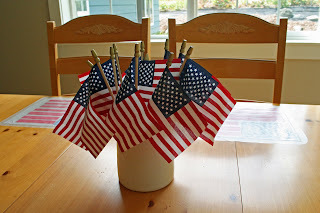 They look great on the kitchen table with the cute and simple patriotic centerpiece. I filled my Ikea white pitcher with flags from the dollar section at Target. 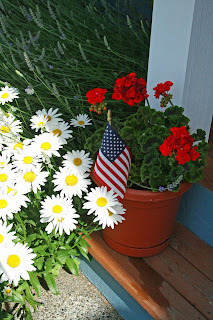 I had a few spare flags, so after seeing this post from Shannon at Bless Our Nest, I decided to stick them in the flower pots on my front porch. We had bbq hamburgers and corn on the cob for dinner on July 4th, followed up with a patriotic dessert. It had to be a quick and easy dessert because I was *busy* working on my H.U.G.E. project all day. 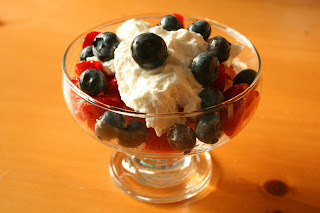 I sliced up some angel food cake and topped it with sliced strawberries, blueberries, and Cool Whip. My children were confused about the Cool Whip--I guess I've never given it to them before! Once they figured out that it is sweet, they were happy with dessert. I haven't posted about them yet, but at a garage sale a few weeks ago, I found two bookcases to match my Broyhill Fontana media armoire. I love my armoire and now that we've done (well, mostly done!) 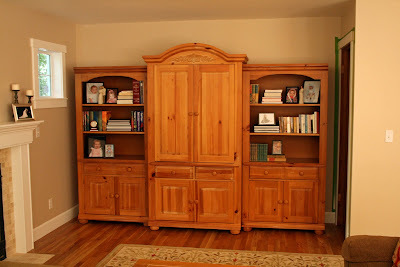 this addition, I have room for the matching bookcases...except they aren't made any more! I've been stalking Craigslist looking for them, but haven't had any luck...so I was *thrilled* to find them at a garage sale! I think I spent $275 on the pair of them plus a matching square coffee table and it was money well spent in my book! 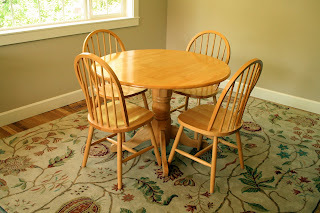 Well, when my husband went to pick them up for me I had him ask if they happened to have the Broyhill Fontana table that they wanted to get rid of. You see, I had noticed they had the chairs out at their garage sale...so I was hoping they had the table stashed away inside their house. And they DID!! The downside? It wasn't for sale. I was sad, but called and gave them my number in case they changed their mind. And they DID!! The downside? They wanted $700 for the table, six chairs, and tile top server (kind of a mini buffet.) Again I was sad--I called and left a voicemail saying that I loved the set but that I just didn't have $700 to spend but that I appreciated them giving me the opportunity to buy their furniture. Know what happened next?? They called and said I could have the set for $550! (Or something like that...I forget the exact price.) I was thrilled! 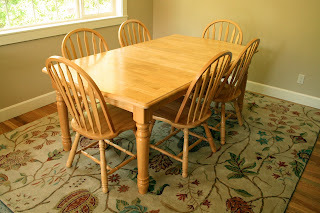 I wanted the table to use in the breakfast area in the addition--the space is one big area and it would look great with my armoire and new bookshelves. I went back and they were kind enough to sell it all to me for $475! I'm so happy! The downside? We just finished a addition project that went over budget and buying new furniture really should have been put off six months. Ooopsie! Craigslist to the rescue! I've been selling stuff on there for the past 1 1/2 weeks and have made $650 so far! That just about covers my garage sale purchases! 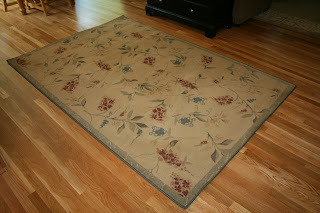 And I cleared more space in the garage by selling *two* of these rugs for $40 each--they've just been rolled up in the corner for five years now! I'm happy to get this stuff out of here and thrilled to make some decent money off of it. Now our formal dining room is a playroom, I can *almost* get my car in the garage, and I've partially furnished our new addition without breaking the bank. Hooray for Craigslist! Seeing their joy gives me joy.